Pompano Drum Circle 2011 new installation by Bill and Mary Buchen commissioned by the Broward County Cultural Division, Fort Lauderdale, Florida. 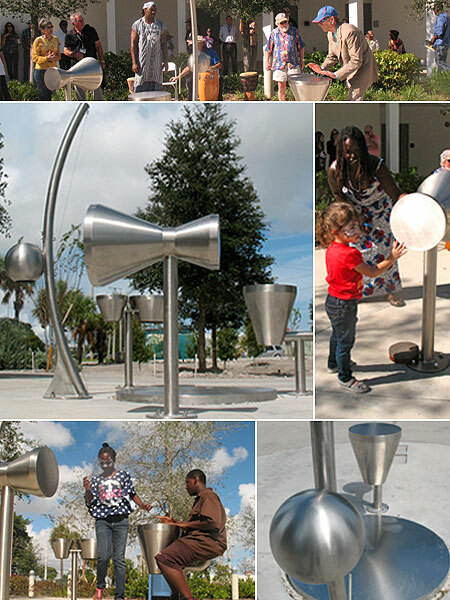 The artwork at the Pompano Beach Transit Center is a space for playing music based on drum archetypes from around the world. Drawing upon the musical traditions of the diverse cultures represented in the Pompano Beach community, the Pompano Drum Circle connects people and these traditions through the universal language of rhythmic percussion. Sited on a paved circle adjacent to the Transit Center Services Building, a grouping of five sculptural instruments invites communal music making while passing time waiting for the bus. Individual components include: the Earth Drum, Earth Bow, and the Djembe, Tambor and Bata Drums. The sculptural drums are inspired by musical traditions from the United States, Brazil, Africa and the Caribbean. This artwork is an innovative solution to stimulate transit ridership by enhancing the visual appeal of the Transit Center and offering a participatory activity to engage the attention of passengers. The Pompano Drum Circle appeals to a broad cross section of the public while reflecting the cultural and historic background of the community in which it is located. Earth Bow: Inspired by the Brazilian Berimbau, it’s played by striking the tensioned wire with the attached nylon stick. 1. Bata Drum: has cultural roots in Haiti, Cuba and West Africa. 2. The African Djembe drum is used in musical ensembles throughout the world. 3. The Tambor Drum originated in West Africa and was brought to Brazil where it is found in Samba bands.